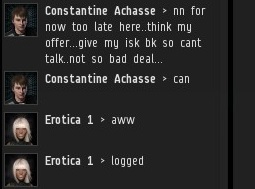 Out of nowhere, I received a convo invitation from Erotica 1, and just like that, it was another interesting day in highsec. A group chat? I had no idea who Constantine Achasse was, or what was going on. 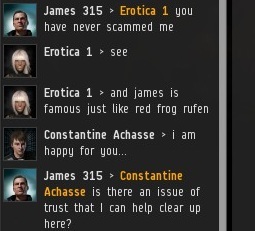 I had to confess the truth: Erotica has never scammed me. It seemed that I had been pulled into an ongoing conversation, to serve as a character witness. Erotica 1 is among the most prominent residents of Jita. She specializes in doubling isk. I first came across Erotica's work when she posted a thread in the Crime & Punishment subforum of EVE-O, warning of slanderous trolls who try to disrupt her isk doubling business. To begin with, a highsec resident needs to become fully aware of my website. If CCP wants to improve new player experience, they really ought to put a link in the tutorial. Or better yet, on the client download page. Maybe if MinerBumping had the word "University" somewhere in the title, we would qualify for special treatment. As I was getting Constantine squared away, Erotica was able to fetch another character witness, CSM candidate Psychotic Monk. He had things to do, but was able to put in a good word for Erotica. I began to wonder how many people had already passed through this convo before I arrived. But this wasn't all about me. I was there to help Constantine and Erotica sort out some problem. I leapt into action. So far, so good. 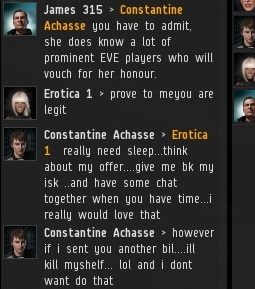 Both parties agreed that Erotica had indeed doubled a sizable amount of isk for Constantine--precisely what you would expect from an isk doubler. ...But there were complications. Constantine had sent Erotica an additional billion isk, requesting another doubling. The timing couldn't have been worse. 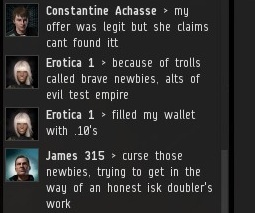 Erotica had to leave, and at that very moment, her wallet came under attack from members of Brave Newbies Inc., who filled it with a stream of 0.10 isk contributions. 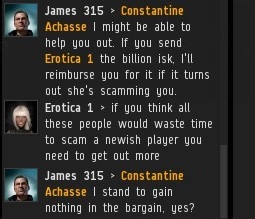 Because of the isk spam, Erotica could not verify Constantine's billion isk was received. But she was willing to send him 6 billion, if he sent an additional billion as a show of good faith. Otherwise, Erotica ran the risk of being scammed by Constantine. 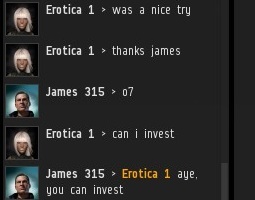 I was extremely confident of Erotica's honour, so I volunteered to put a billion isk of my own money on the line. However, Constantine's head was swimming, and he needed to get some sleep. He couldn't think straight. Constantine retired for the evening. 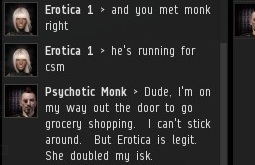 At least he understood that isk doubling is best done after a good night's rest. Before I left, Erotica volunteered to make a contribution to the New Order. Like all responsible businessmen and businesswomen, Erotica wanted to give something back to the community from which she had benefited so much. The New Order was a natural choice. There's no better charitable organization in highsec. Having become the New Order's new top shareholder, Erotica 1 bid me (and someone else she invited) adieu. An isk doubler's work is never done. Positive character references from the Supreme Protector *and* Psychotic Monk. Guest appearance by Boom Boom Longtime! Who could James be if not the saviour? 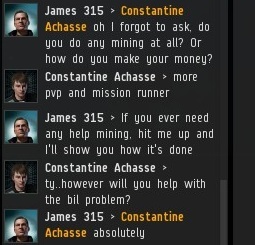 Who else could extract 6 billion ISK from a Jita scammer? Confirming Erotica 1 is legitimate. \o/ A sincere thank you to Erotica 1. Without philanthropists like you, my EVE-profession would be impossible. And she also recognizes James 315 as a legitimate investment in the fiewld of miner education. I gather that Erotica 1 offers extra security to New Order shareholders and supporters. Damn you Brave Newbies!!!! How dare you troll the right honorable Erotica1!!! I liked the bit where the miner got bumped. ISK doublers are philanthropists who give hope of a better future to honest workers... They realize dreams and change lives. It's so sad when trolls try to question their legitimacy. "My wallet in spammed with .10's." Hilarious as always. You would save so much time should you load up your API to check & verify deposits instead of arguing with multiple people in chat. The ladies DO love a Supreme Protector / Savior. Sadly our player did not send proof. He was so close to 6b.... perhaps he was a scammer after all.